If you have commercial grade kitchen equipment and supplies, you’ve probably seen the NSF logo on many of your products. But do you know what it means to have an NSF certified product? Not to be confused with the National Science Foundation, the foodservice related NSF does not stand for anything today, although in the past this acronym stood for the National Sanitation Foundation. 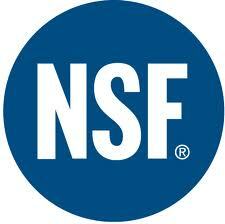 What is NSF Certification? A Product that is certified or listed means that NSF has determined that a tested product meets NSF’s standards of safety. It is only after a product is certified, that a manufacturer is allowed to use the NSF Mark. What does it mean to have an NSF product? Products stamped with an NSF logo have been put through rigorous testing to ensure that they are safe. These products are also guaranteed to be accepted by state and local regulatory agencies (i.e. health inspectors). Keep in mind also that NSF Certification is not a one-time activity. Tests are periodically performed on a product to ensure that it continues to meet the standards after its initial certification. Are all commercial kitchen supplies NSF approved? No. Certain items must be certified to pass health inspections, such as Refrigerators, Ice Machines, and Freezers. Other items that need to be thoroughly sanitized such as Countertops, Prep Tables. Make sure to check with your insurance provider to see what products they require to be NSF certified, as they may not cover damages caused by a non-certified product. Buying Guide: Commercial Refrigeration	What is UL Listed?